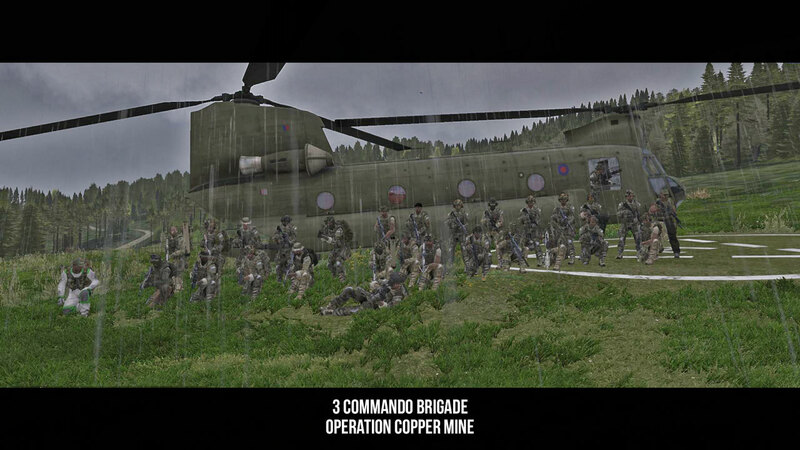 Well done to all involved in this weekend's impromptu Op on the public server, "Operation Copper Mine I". Open to public players, but organised and led by 3 Commando Brigade members, 35-40 marines enjoyed a 2 hour deployment on Bystrica. Heading out from our northern FOB in vehicle convoy, 3 close combat Sections, close air support, armoured units, sniper/recon and other FSG elements, assaulted and captured three enemy held villages at Objectives 'Bronze', 'Silver' and 'Gold'. At Gold, a surprise (Zeus) counter-attack from the AAF tested everyone to their limits, but no one was found wanting. Despite the persistent rain, spirits were not dampened, and great coordination and team-work by all involved led to a very successful mission with a lot of fun being had along the way. That aside, it was a good op. Sounds like a nice little follow up op to save Zulu.